HashMap is a Collection class in Java that stores objects with the help of hascode and equals. It is said to be faster in retrieving objects. Lets create a custom implementation of HashMap and understand how it works. To understand HashMap you need to first understand Singly and DoublyLinkedList. HashMap stores objects in form of Key and Value. A value can be fetched by passing the Key. HashMap stores objects into different buckets(LinkedList). The object with same hashcode are stored in same LinkedList. Remember that the objects are stored in key-value pairs. The hashcode of key is used and not the hashcode of value. Only Key alone is required to put and get the object. Value is just a object placed against the key, So depending upon how many objects(Keys) are present with different hashcodes, that many LinkedList gets created. An array is used to bind all these LinkedList together. The elements of the array have the pointer to the start of the linked list. Below diagram gives a more clearer picture. 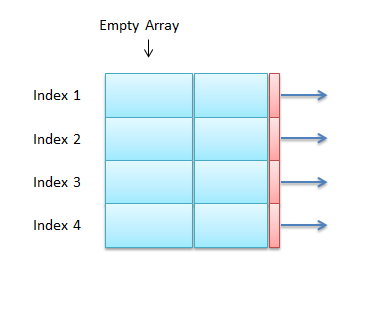 Below method findArrayElement is used while putting/adding data in HashMap and while getting data from HashMap. It takes a parameter of type Key. It iterates thorugh the array and finds out the element whose key's hashcode matches with the hashcode of the passed Key parameter. Below method is used to add the Key-Value pair in HashMap. It is similar to put method of java.util.HashMap. The method first calls the findArrayElement method to find out the element where the key-value pair should be placed. If matching elments key.hashcode is not found in array a new element is created with key as same as the key of the object being saved. Value is kept null in the array element as it is not required. After the element is created/found in array. The key-value pair is attached to the LinkedList which is pointed by the found element array. Again if no Linked List is present for that element in Array and a new LinkedList is created. This element is attached at the end of the Linked List. 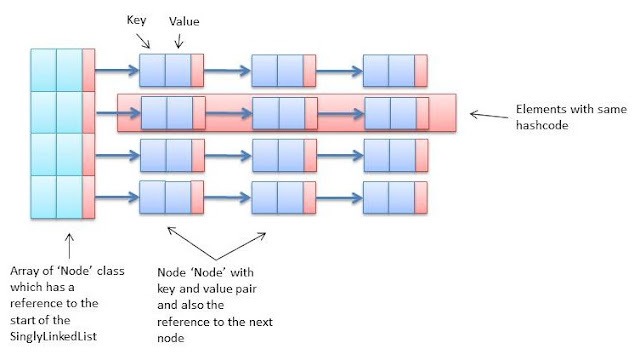 Below method is used to iterate the Linked List and attached the new Node at the end of it. System.out.println("Linked list present for HashCode : "
Below method is used to get the Value based upon the passed key. This is a very important method. This is what makes HashMap different then other Collections. First we use findArrayElement, to find out the correct bucket, that is the element in array which can point us to correct Linked List. Once the LinkedList is identified the correct key-value pair is identified by iterating though the LinkedList and comparing the key of the passed parameter with the key of key-value pairs in the LinkedList. The equality is checked by using the equals() method. + " with current element value : "
Lets now test our code. The key being used in test code is of type EmployeeId class, having Integer empId. Since the EmployeeId objects will be used as Keys, we have implemented hashcode() and equals() method. The equals checks for the empId to be equal. Hashcode() returns the int depending upon the value of empId. it return 1 if empId is 2 or 3, it return 2 if empId is 4 or 5 and so on. By this it is guaranteed that the size of LinkedList will not exceed by 2. Below is the main method which creates object of our CustomHashMap and adds key-values to it. The value could be anything from a normal String to a custom class. We have used here Employee class. Having id and name attributes. The performance of the HashMap hugely depends on the implementation of hashCode() method. Based upon the hashCode() the size of the array of a hashMap is determined. hashCode() should not be unique for each key. This will enforce only one Node present per LinkedList. So the complexity of HashMap will be similar to a ArrayList. Also hashCode() should not be common for all keys. This will create a single LinkedList and the complexity of HashMap will be equal to a LinkedList. HashCode should be designed in such a way that the structure of the HashMap is distributed in Array and size of LinkedList. Hashing is a huge topic and not in scope of this blog. 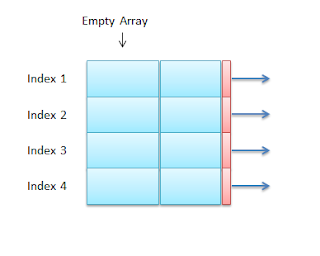 The process of creating Array is kept simple and restricted to creating only 7 elements. In java.util.HashMap if the Array is about to get full and new array is created and the elements from old array is copied in the new one. The size of the new Array is 3/2 times the first one. Thank's for sharing this awesome post.